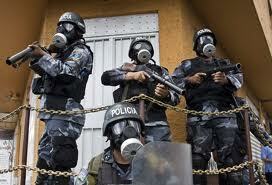 Cut Military and Police Aid to Honduras. Reports are coming in from Honduras that the military has violently removed the campesinos from the highway blocade in Aguan and that the community of Guadalupe Carney is being surrounded. 1. Your alarm regarding the police operation being conducted en the community of Zacate Grande at this moment where police are reportedly beating and gassing community members. 2. Your concerns for the detainees who have been take by police. 3. That the evictions which occurred today and the massacre of Nov. 15th show that the human rights situation in Honduras is quickly deteriorating and the violence is directly linked to the anti-democratic coup and fraudulent elections last year, which the US government supported. The US should immediately cut military and police aid to Honduras.